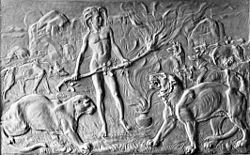 Mowgli attacking Shere Khan: detail from a clay bas-relief by John Lockwood Kipling, father of Rudyard Kipling, from "The Works of Rudyard Kipling" Vol. 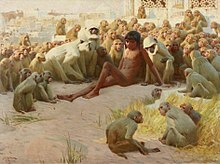 VII: The Jungle Book, 1907. This is a list of characters that appear in Rudyard Kipling's Jungle Book story collection, its sequel The Second Jungle Book, and the various film adaptations based on those books. Characters include both human and talking animal characters. Tabaqui the golden jackal (left) torments Father Wolf and his family, as illustrated the 1895 edition of The Two Jungle Books. Mowgli (मोगली Maogalī; feral child) - Also referred to as "Man Cub". Jungle characters - The following characters reside in the jungle. Akela (अकेला Akēlā, "alone"; Indian wolf) - The leader of the wolf pack. Raksha (रक्षा Rakṣā, "protection"; Indian wolf) - Also called Mother Wolf, she is Mowgli's adoptive mother. Rama (रमा Ramā)/Daruka (दरुका Darukā) (Indian wolf) - Also called Father Wolf, he is Mowgli's adoptive father. Grey Brother (Indian wolf) - The oldest of Father Wolf and Raksha's cubs. Leela (लीला Līlā; Indian wolf) - The granddaughter of Akela. Baloo (भालू Bhālū, "bear"; sloth bear) - Mowgli's best friend. In Kipling's book, he is described as a sleepy old brown bear, who teaches Mowgli the law of the jungle. Bagheera (बघीरा Baghīrā; بگیڑہ Bagīrah, "black panther"; black panther variety of Indian leopard) - Mowgli's mentor. Bandar-log (बन्दर-लोग Bandar-lōg, "monkey-folks"; grey langurs) - A society of monkeys who are treated as pariahs for their scatterbrained anarchy. They kidnap the very young Mowgli, who is rescued by Bagheera, Baloo, and Kaa. Kaa (का Kā; Indian rock python) - Mowgli's wise mentor and friend, though also feared throughout the jungle for his mesmerising "hunger dance". Hathi (हाथी Hāthī, "Elephant"; Indian elephant) - The leader of the jungle's elephants and the individual called "The True Master of The Jungle". Tabaqui (तंबाकूवी Taṃbākūvī; "Dish-Licking Dog"; golden jackal) - He feeds on scraps from either Shere Khan or the wolves of the Seeonee Pack. In some adaptations, he is a hyena. Tabaqui is the only friend of Shere Khan as well as Shere Khan's spy and messenger. He is killed by Grey Brother after the Grey Brother interrogates him into admitting both what Shere Khan plans to do and where and then crushes the jackal's back in "Tiger! Tiger!". Mang (मङग Maṅg, "go"; bat) - A bat. Shere Khan (शेर खान شیر خان (Śēr Khān, "Tiger King" ("Khan" is a common title of Indian Muslim lordship and royalty); Bengal tiger), - A man-eating Royal Bengal Tiger who is the main villain and the archenemy of Mowgli. He is often known as "a chief among tigers" and in multiple adaptations as the one called "The King of Tigers". Despite being born with a withered leg and derisively nicknamed "Lungri" ("The Lame One") by his own mother, Shere Khan is aggressive, arrogant, self-centered, and sees himself as the rightful lord of the jungle. Tabaqui is his only friend. Rama (रमा Ramā; water buffalo) - A water buffalo. Mysa (मौसा Maisā, "uncle"; water buffalo) - A water buffalo. Chil (चील Cīl, "kite"; brahminy kite), in earlier editions called Rann (रण Raṇ, "battle") - A kite that serves as a messenger. Sahi (इकी Ikī; Indian porcupine) - In earlier editions, he was called Sahi (साही Sāhī, "porcupine"). In later editions, he was called Ikki. Tha (था Thā, "He was"; Indian elephant) - The first of the elephants according to Hathi. Thuu (थू Thū; Indian cobra) - Also called White Hood, Thuu a blind albino cobra. Mowgli gives him the derisory epithet "Thuu" (meaning "it has dried") upon discovering that the supposedly deadly cobra's fangs are in fact withered and dried up from age and disuse. Jacala (जाचला Jacalā, "obstacle"; Indian crocodile) - A large mugger crocodile. In "Red Dog", it is stated that Mowgli broke a knife on Jacala's back during a protracted fight with him. Mao (मवा Mavā; Indian peacock) - In earlier editions, he was called Mor (मोर Mōr, "peacock"). Phao (फवा Phavā; Indian wolf) - Son of Phaona, leader of The Free People. Human characters - The following characters are known humans. Messua - The wife of the richest man of the human village, who decides to adopt the wild Mowgli, believing that he is their long-lost son Nathoo. Messua's husband - An unnamed man who is the richest man of the village. Nathoo (नत्थू Natthū) - The long-lost son of Messua and her husband, who has been snatched by a tiger. Buldeo (बलदेव Baladēvā) - The elderly chief hunter of Messua's village. He is boastful, arrogant, greedy and superstitious, and he is furious when Mowgli, who knows what the jungle is really like, contradicts some of his own more fanciful stories about the jungle. He hopes to kill Shere Khan so he can get a substantial reward placed out as a bounty for the tiger's skin. Kamya (काम्या Kāmyā) - One of the village boys who herds buffalo along with Mowgli. Nag and Nagaina (Indian cobras) - "Nag" is the Hindi word for "cobra." Darzee (tailorbird) - "Darzee" means tailor in Hindi. Chuchundra (Asian house shrew, called a muskrat in the story) - His name is derived from "chuchunder", a term used for his species in India. The Gavial (Gharial) - The Mugger's cousin. King Louie - The orangutan who leads the Bandar-log. In the 2016 film, he is a Gigantopithecus. He is voiced by Louis Prima in the first movie, Jim Cummings in TaleSpin, Jason Marsden in Season One of Jungle Cubs, Cree Summer in Season Two of Jungle Cubs, and Christopher Walken in the 2016 film. Winifred - Colonel Hathi's wife and the mother of Hathi Jr. who serves as Hathi's second-in-command of the Jungle Patrol. She is voiced by Verna Felton in the first movie and by Kath Soucie in "Jungle Cubs." Hathi Jr. - The baby elephant who is the son of Hathi and Winifred and is a good friend of Mowgli. He is voiced by Clint Howard in the first movie and by Jimmy Bennett in The Jungle Book 2. Flunkey - King Louie's monkey servant and lieutenant. He is voiced by Leo De Lyon in the first film and by Jim Cummings in The Jungle Book 2. Buzzie, Dizzy, Flaps, and Ziggy the Vultures - Four vultures who closely resemble the Beatles because of their shaggy moptop haircuts and Liverpool accents. Buzzie resembles Ringo Starr, Dizzy resembles George Harrison, Flaps resembles Paul McCartney, and Ziggy resembles John Lennon. Their song "That's What Friends Are For" was sung in the style of a barbershop quartet instead of a Beatles song. Disney was originally going to have The Beatles voice them, but John Lennon refused the offer. Buzzie was voiced by J. Pat O'Malley in the first film and by Jim Cummings in The Jungle Book 2. Dizzy is voiced by Lord Tim Hudson in the first film and by Baron Davis in The Jungle Book 2. Flaps is voiced by Chad Stuart in the first film and by Jeff Bennett in The Jungle Book 2. Ziggy is voiced by Digby Wolfe in the first film and by Jess Harnell in The Jungle Book 2. Shanti (named only in The Jungle Book 2) - The girl whose song "My Own Home" lured Mowgli into the Man Village in the 1967 film. Shanti later serves as his ally/love interest in the sequel. Shanti is voiced by Darleen Carr in the first film and by Mae Whitman in The Jungle Book 2. Ranjan (The Jungle Book 2) - Mowgli's adopted younger brother. He is depicted as the son of Messua and her husband. Ranjan is voiced by Connor Funk. Lucky (The Jungle Book 2) - The vultures' friend who loves teasing Shere Kahn as seen in The Jungle Book 2. He is voiced by Phil Collins. Rocky the Rhino - Rocky is an Indian rhinoceros. In the earlier production of the first film, Rocky was to appear in the same scene as the Vultures where he would've been voiced by Frank Fontaine. Unfortunately, his part got scrapped. Rocky did appear in the 2016 film voiced by Russell Peters where he was among the animals observing the Water Truce. After telling Mowgli to watch himself after being backed into him upon being accidentally pricked by Ikki's quills, Rocky tells Raquel that Mowgli is a man-cub. Raquel the Rhino (2016 film) - The daughter of Rocky the Rhino. She is voiced by Madeleine Favreau. Fred the Pygmy Hog (2016 film) - A pygmy hog who is one of the neighbors and friends of Baloo. He was voiced by Jon Favreau. Giant Squirrel (2016 film) - An Indian giant squirrel who is one of the neighbors and friends of Baloo. The Giant Squirrel was the one who supported Baloo's claim to Mowgli that the honey works to soothe the bee stings as he claims that it's nature's ointment. He was voiced by Sam Raimi. Pangolin (2016 film) - An Indian pangolin who is one of the neighbors and friends of Baloo. No voice actor was credited for this role. ^ see http://www.shabdkosh.com/en2hi/search.php?ts=1221774293378&e=शेर – according to Erika Klemm: Hindi-deutsches Wörterbuch (Leipzig 1971) शेर means "lion" or "tiger"
Wikimedia Commons has media related to The Jungle Book characters.